Georgia Dunn Studio: The Twelve Days of Halloween: Day One, Halloween Specials! The Twelve Days of Halloween: Day One, Halloween Specials! "On the first day of Halloween my true love gave to me, a spooky special on the tv!" Hello again, oh so soon! Today marks the beginning of the Twelve Days of Halloween and for the next dozen days I will be sharing a spooky story, movie trailer, song, or tradition of Hallow's Eve! I'm easing into the scary with a celebration of five great Halloween holiday specials! The first four on the list include links to watch the entire special. Sadly the fifth cartoon I could not find full length anywhere on the internet. If anyone can find it, I'd love the link! 5. Disney's Legend of Sleepy Hallow: Icabod Crane and Disney's first incarnation of Beauty and the Beast's Gaston (no, seriously watch it) vie for the affections of the town beauty. Bing Crosby narrates my childhood nightmares in this genuinely spooky rendition of the Washington Irving classic. Chase that nerd outta town, Gaston! 4. Casper the Friendly Ghost -There's Good Boos Tonight: This wasn't strictly a Halloween special, but I remember it coming on tv every year in October and breaking my heart. Casper had the worst non-existence of anyone dead or living. Not only was he obviously a dead child which is sad enough, but he was also an outcast. In this haunted tale Casper finally makes a friend and teaches children every where the horrors of fox hunting. Watch it to the end, and if you don't cry at least once (sad or happy tears) then you have no soul. 3. 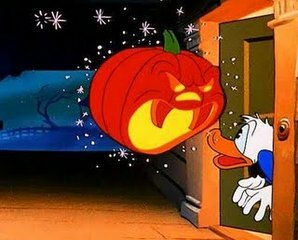 Donald Duck Trick or Treat: Remember when Donald Duck was funny? I mean, ridiculously funny? Donald was always that bachelor uncle who wasn't really that different from your actual bachelor uncles. He clearly wasn't one for kids to begin with, and yet he was saddled with three nephews who loved 'jokes' like packing snowballs with ice or convincing Donald he was dying. In this 1952 cartoon the boys gain the sympathy of Disney's character Witch Hazel and make sure Donald thinks twice before skimping on candy again. 2. Garfield's Halloween Adventure: On October 1st I shared this gem, and while it's number two on this list, it's my own personal favorite. Garfield and Odie face a ship full of pirate ghosts who return at midnight for the gold they stashed one hundred years ago. It's still hilarious (and truly scary) after all these years. Plus the songs are awesome. 1. It's the Great Pumpkin, Charlie Brown! Without a doubt this is the most popular Halloween special of all television history, and so of course I couldn't find a link to the entire episode. Here are three clips from Charles Schultz's tribute to trick or treating, bobbing for apples, and social rejection. With eerie music, watercolor splashed October skies, and a certain doghouse flying beagle this cartoon connects with kids young and old year after year. (I always root for poor Linus). I hope you enjoy these specials! I'm looking forward to the next eleven days. I've been encouraging folks to celebrate the Twelve Days of Halloween with their own favorite songs, games, movies, memories, etc of the holiday. So if you'd like to take part go on and take a stab at it! (Sorry Amy, I had to). This is the first year that I've really experienced the American fascination with all things Hallow'een. Despite 12 years in Canada, somehow, it was never looked forward to with so much anticipation as you (and several other blogger chums) do. It's most educational! Continue to enjoy - was Day two when you mentioned Uncle Brendan the British Bunny? I believe it was day one--in the post right before this one!